Save time, expense, and include more stakeholders – by replacing travel with online video meetings. VeriShow’s web meeting software lets you meet face-to-face with clients and employees on the web. What’s the true cost of work-related travel? Transportation and hotel expenses tell just part of the story. The real costs lie in the loss of productivity of employees who travel and the fact that all stakeholders can always attend out-of-town meetings. With VeriShow’s live website support & real-time collaboration features, including chat, audio, and video conferencing, presentations and image sharing, co-editing, and annotation , your employees can demonstrate products and collaborate with clients from the convenience of their own offices. 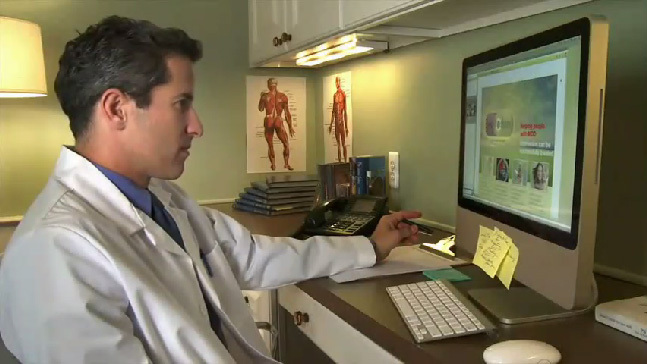 This pharmaceutical sales rep uses VeriShow to have a face-to-face meeting with a physician. The rep is able to share information with her and answer the doctor’s questions. Holding the meeting online lets them both save time and travel.